You can use it to look up sailboat parameters in a large database of boats, or enter your own boat and compare to the others. In addition, for any boat you can calculate a set of quantities that will help you measure how it will perform. 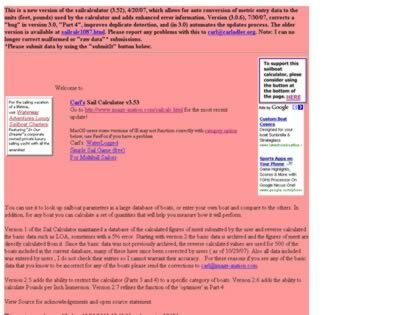 Web Site Snapshot: If available, above is a snapshot of the Carl's Sail Calculator web site at http://www.tomdove.com/sailcalc/sailcalc.html as it appeared when this site was added to the directory or last verified. Please Note that Boat Design Net has no involvement with the above web site; all content and images depicted in the above thumbnail are the property and copyright of Carl's Sail Calculator unless otherwise noted on that site. Description: You can use it to look up sailboat parameters in a large database of boats, or enter your own boat and compare to the others. In addition, for any boat you can calculate a set of quantities that will help you measure how it will perform.